There is an Ethiopian restaurant near my house that I’ve wanted to try for a while. Since my new year’s resolution is to eat one new food each week (hence the reason this blog exists), I figured I’d check it out for week one. Addis Red Sea is known for having authentic Ethiopian cuisine and, man, it was good. I took my favorite friend with me and we chose the Vegetable Combination, which includes your choice of four vegetarian dishes and a salad. So, honestly, this week I tried four new foods, so I am reserving the right now that if in a future week I don’t eat anything new, I have a free pass from this impressive week 1. I’m glad I knew the drill with Ethiopian food, because otherwise I would have been totally confused with the lack of silverware – Ethiopian food is eaten with Injera bread, a spongy thin bread that also serves as your utensil. It’s also delicious. We both agreed that our least favorite dish was the butecha, the chickpea paste – it didn’t taste bad but it was just kind of, well, pasty. And really dry. 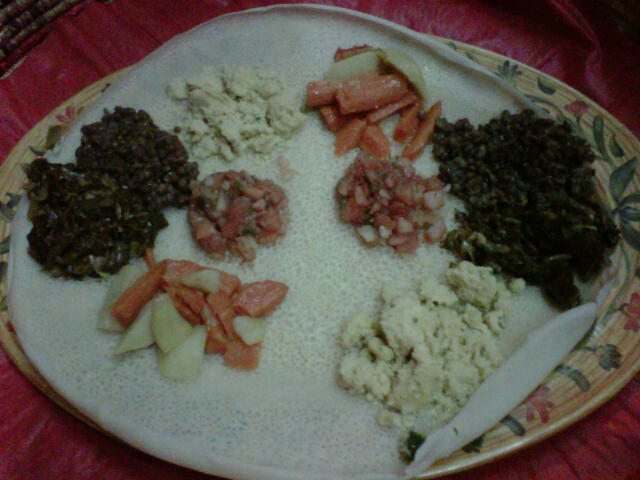 Our favorite dish was the lentils (yemeser alche), which were super flavorful and terrific when scooped up with a bit of the atakilt (mixed vegetables). The salad served with the combination plate was also terrific. We tried Ethiopian beer of course, which was really quite tasty. If I knew where else I could get it I would totally order it again. This was a great week 1, I have to say. Not only was the food delicious, but we had so much fun trying it out together. Not only did we love Addis Red Sea and will definitely go back again, but we’ll certainly try out other Ethiopian restaurants as well.